For those who have been there during this time, you would probably know that New York over Christmas and the New Year can be a truly amazing experience. New York during this time of the year can also be prohibitively expensive. 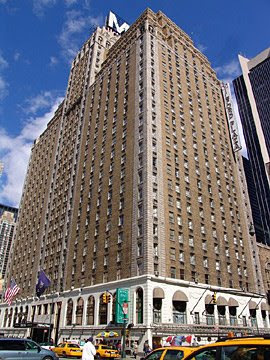 Which is why I was pleased to have found Milford Plaza (on the edge of 8th Ave and 45th Street) on the Internet when I recently went to New York. The costs of a standard room with Club lounge access (US$120 or so per night) is one of the most competitive and value-for-money in New York's uber expensive accomodation scene (where $200 and over a night is more the norm). The location of the Hotel is also very much central: being only about 5 minutes walking distance from both Times Square and Broadway, visitors would have quick and easy access to some of New York's most famous landmarks. When I first arrived at the hotel, I found the room to be functional, if a little antiquated. That said, there was definitely a certain rustic charm to the room. One little matter though was that the walls appeared to be somewhat thin, which allowed me to eavesdrop on conversations that took place in adjoining rooms if the visitors in those rooms were too loud (and presumably, for them to listen in to conversations that I had if I were too loud). This was of course, part of the charm of the place, and can be easily overlooked, though I can imagine how disconcerting that might be if you were attempting to sleep at night and you were beside a particularly noisy neighbour (I was blessed with early sleepers as neighbours). There was a view of New York from my hotel room - while nothing spectacular, it is easy to forget that given the hotel's considerably lower-than-norm charges, the fact that any view is available is, in and of itself, quite a bonus. The lift-allocation-system is also structured in such a way that in most instances, you'd be given a dedicated lift to go to the level that you need - while some find the system inconvenient (and to be sure, it is, to some extent), I loved it since it means there is no need to engage in small talk with other guests. That is not to say the Hotel is not without its faults. For one, it did appear during my stay that there were too many people who had access to the Club lounge, making it impossible to get seats in the Club lounge if you are not an early riser (whenever I went to the Club lounge at 9:30 am, for example, it was impossible to get seats, though it was much easier to get seats whenever I went earlier than 9 am). The Club lounge is also separate from the level the hotel room is on, which does mean the little inconvenience of taking the lift whenever you needed to go to the club lounge. In short, Milford Plaza is not perfect, and definitely no big-name 5-star hotel, but for its costs and central location, is extremely value-for-money, especially in the festive season where most other comparable hotels charge almost double what Milford charges.